What can seismicity tell us about subterranean volcanic activity? from the paper being discussed. It is from here. In a Science paper*** last week, Saunders et al. present a tantalizing relationship between episodes of seismicity at active volcanoes, the growth of rims on small crystals (of orthopyroxene), and intrusion of new batches of magma into shallow levels of the system. The underlying science is that the composition of crystals growing in a magma responds to any changes in the conditions of the magma--composition, volatile content, temperature, pressure, and oxidation state. Saunders et al. examined iron (Fe)-magnesium (Mg) zoning in 579 orthopyroxene crystals takenfrom Mount St. Helens eruptions between 1980 and 1986. They found four categories of zoned crystals: some with Fe-rich cores and Mg-rich rims, so-called 'reverse-zoned' crystals; some with Mg-rich cores and Fe-rich rims, so-called 'normal-zoned', multiply zoned, and patchy zoned. By modelling diffusion of elements they calculated that the crystals formed in <12 months. The authors attribute the zonation to changing oxygen fugacity and H2O concentrations. The cores of the opx crystals appear to have been entrained from an old, partially crystallized magma. 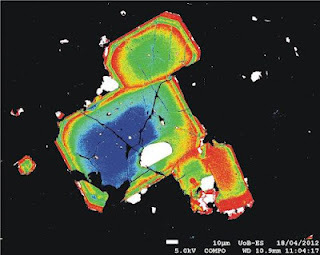 Normally zoned crystals may have resulted from rapid cooling of crystals suspended in a new magma pulse as they intrude into the reservoir, or of rapid crystallization induced by fluxing with CO2-rich gas. Reversely zoned crystals may have been produced as crystals already in the chamber are subjected to heating by the intruding magma. These crystals are first partially resorbed, and then overgrown with a Mg-rich zone that is in equilibrium with the new hotter, adjacent mel. Unzoned crystals are ambiguous and the authors offer several interpretations. The authors then took the date that the crystal was erupted and subtracted the rim growth time to obtain the month in which the opx rim began, presumeably due to a magmatic perturbation. They plotted these dates on a graph of the seismicity and SO2 emission flux and found that the peaks in the growth dates corresponded to episodes of deep seismicity, especially in 1980 and 1982. The implication is that at least in some instances, the seismicity is related to intrusion of magma. ***Saunders, K., Blundy, J., Dohmen, R., and Cashman, K., Linking petrology and seismology at an active volcano, Science, 336, 1023-1027, 2012. On CNN today (May 18), there is an amazing video of a 300,000 cubic meters landslide in the Swiss alps. It's stable footage from a helicopter. Perhaps as impressive as the landslide are the obvious fractures in the ground that has not yet failed but will inevitably go. One of the rips goes right through a barn. It is at Preonzo, Switzerland, according to a YouTube version. The biggest sandbox in the world....? During the 1812 New Madrid earthquake (southeastern United States), individual bodies of sand as much as 2 m thick appeared patchily over a 4000 km2 area. The sand volume was estimated to be to be 105–107 m3 and there were claims that it was the largest reported extrusive sand (extrudite). There have been no reports of extrusive sands as voluminous as several cubic kilometers. Typically, extrusive sands connect to their parent sandbody or sandbodies in the subsurface via hydraulic fractures. Using three-dimensional seismic and well data from the northern North Sea, Loseth and colleagues describe a large (10 km3) body of sand and interpret it as extrusive. To their knowledge, this is the world's largest such sandbody. It would bury Manhattan, New York (60 km2), under 160 m of sand, or the whole of London, UK (1579 km2), under 6 m of sand. This sand vented to the seafloor, when it was more than 500 m deep, during the Pleistocene glacial period. The sandbody (1) covers an area of more than 260 km2, (2) is up to 125 m thick, (3) fills low areas around mounds, which formed when underlying sand injectites lifted the overburden, (4) wedges out, away from a central thick zone, (5) is locally absent along irregular ditches, 20 km long and up to 50 m deep, which overlie feeders on the flanks of the mounds, and (6) consists of fine-grained to medium-grained, sub-rounded to rounded grains. A pretty big sandbox to play in!! Bathymetry of summit of Monowai Cone May/June 2011. How fast can a volcano spew out magma? This is a question that has perplexed volcanologist for a very long time. Recently a team of scientists, led by A.B. Watts of Oxford University, conducting a routine bathymetric survey onboard the research vessel SONNE, were fortunate enough to be in the proximity of Monowai seamount volcano when a dramatic eruption occurred. ** Monowai is located along the 2,500 km-long Tonga-Kermadec Arc, where a submarine volcano can be found approximately every 50 km. Eruptive volume versus duration of magmatism for submarine volcanoes. Monowai is not small. It is a 10-12 km-wide strato-volcanoe approximately 1 km high with a 7-10 km wide caldera in its summit, approximately 0.6 km deep. Since it was first discovered in 1944 it has had a history of activity (discoloured water emanations and seismic ity). On May 14, 2011, the scientific team observed gassy discoloured water on the summit of the Monowai Cone. 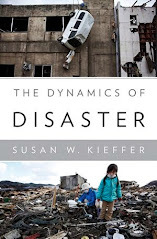 Three days later, a swarm of seismic events began and lasted for 5 days. On June 1, after the seismic activity subsided, the ship returned and carried out a second survey of the cone. They found significant changes in depth at the volcano. The main differences were (1) an increase in depth of up to 18.8 meters attributed to collapse structures on the flanks of the volcano, and (2) a decrease in depth of up to 71.9 m due to growth by eruption of new lava flows. The most striking feature of the surveys was a new cone near the summit. From its dimensions (100 m diameter at its base, at least 40 m high), it appears that about 0.00875 cubic kilometres of magma was erupted, most likely during the 5-day swarm of seismic activity. Extrapolating these rates to annual output, Monowai joins Kilauea, Iceland, Montserrat, the Azores, Hawaii, and the Canary Islands withoutput on the order of 0.1 cubic kilometres per year. **Reported in A.B. Watts, et al., Rapid rates of growth and collapse of Monowai submarine volcano in the Kermadec Arc, Nature Geoscience, Advance publication, doi: 10.1038/NGE01473, posted May 13, 2012. Featured on Geology.com on May 15, 2012. Tonight is a much publicized "supermoon,"a celestial event with the moon makes its annual closest approach to the earth and is opposite the sun giving a full moon. ** The moon's orbit around the earth is elliptical, coming as close as 222,000 miles (perigee) and as far as 252,000 miles (apogee). It will appear bigger and brighter than other full moons. According to space.com, the moon will appear 14% larger and 30% brighter than other times of the year. The moon will appear most spectacular right around moonrise, though this is largely due to an optical illusion rather than to its closer proximity. The exact cause of this illusion is debated. One theory is that the presence of objects, such as trees or buildings in the foreground, make the eye focus differently, and another holds that the brain interprets distant objects as wider. Since the earth tides (both in the solid earth and in its oceans) are caused by the gravitational attraction of the moon and sun (mostly the moon), tides are expected to be higher than normal, but not by enough to get all excited about. NASA estimates about 1" higher than usual, possibly somewhat higher depending on local geography, and also amplified if there are storms in the area. extracted from a NASA video of a longer time-record. There is a lot of speculation on the WWW about possible supermoon effects on earthquakes and volcanic eruptions (good grief--including the Tohoku earthquake in 2011. For a debunking of this, see here.) There is no scientific evidence to suggest any dramatic effects associated with supermoons. There are, however, two other places in the solar system where moons do cause spectacular effects. One is on Io, a satellite of Jupiter. The gravity of Jupiter and its largest moon Ganymede, with help from two other moons Europa and Ganymede, cause tides over 300 feet, as high as a 30 story building. This deformation causes such heating in the interior of Io that it spouts fiery volcanoes of sulfur and sulfur dioxide. The other is on Enceladus, a frigid satellite of Saturn. Enceladus is only 80 K, 80 degrees above absolute zero, at its equator, but at its south pole, temperatures as high as 180 K have been measured. In that region, icy plumes of water ice spurt out into the vacuum of space. The tides on Io and their effect in producing volcanism were figured out by three scientists*** even before the Voyager spacecraft arrived there and observed the volcanism. The tides on Enceladus and their relation to the plumes are still not fully understood. Two different satellites, two different manifestations of tidal energy. **Here is an excellent article about the event from EarthSky.org. While in Edinburgh, we came across a bookstore selling all sorts of maps. 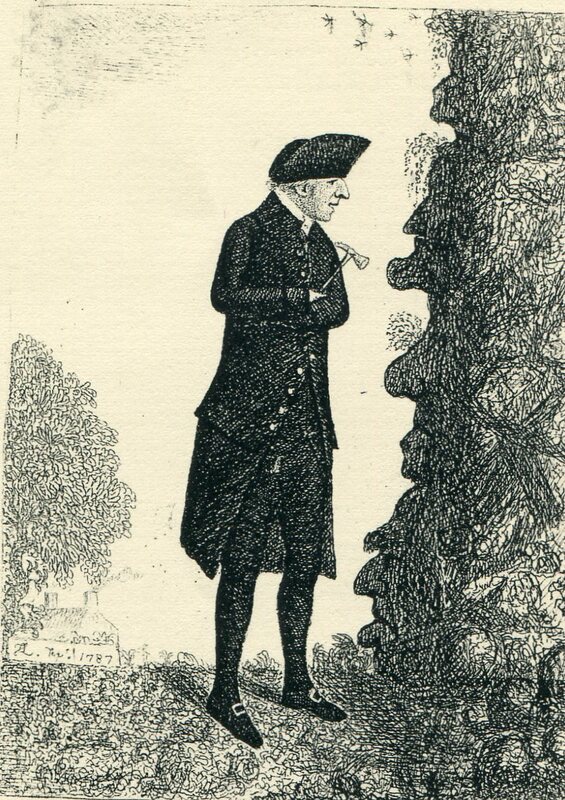 We asked the owner if he had any works related to James Hutton, and he said 'no', but wondered if we had ever seen the caricature shown to the left. Unable to order a copy for us, he xeroxed the famous print of Hutton examining the rocks, and the rocks speaking back to him. How many faces can you see? John Kay (1742-1826) began his career apprenticed to a barber, but in 1785 his hobby of etching caricatures of local celebrities was well enough received that he abandoned his barber career and opened a small print shop in Parliament Square in Edinburgh, where he fluorished. His works were collected by Hugh Paton and published as a series of six volumes entitled "A series of original portraits and caricature etchings by the late John Kay." Publication dates were, I think, 1838 and 1842 for the volumes, nearly 50 years after Hutton's death. The biography of Hutton in Paton's volume is interesting and gives a flavor for how the natural sciences were presented at the time when the sciences were fluorishing. "Dr. Hutton was an ingenious philosopher, remarkable for the unaffected simplicity of hismanner, and much esteemed by the society in which he moved. In his dress he very much resembled a Quaker, with the exception that he wore a cocked hat." After some abortive attempts at law, medicine, and chemistry, in 1786 he devoted himself to "scientific pursuits" for the rest of his life. His first book was @Considerations on the Nature, Quality, and Distinctions of Coal and Calm," and his next were "Theory of the Earth," and "A Theory of Rain," both published in the first volume of the Transactions of the Royal Society of Edinburgh. His Theory of Rain becamse a @subject of controversy, which was conducted with much warmth." He then moved on to more metaphysical subjects, and was writing even on the day of his death in 1797 after an illness of about 5 years. John Playfair (1748 – 1819) popularized Hutton's work with his "Illustrations of the Huttonian Theory of the Earth", published in 1802.